On the face of it, it’s a simple process. Log in to your Kindle Direct Publishing control panel and go to the Bookshelf. Make whatever changes you want to make (upload the new cover/new file, edit the title or description, change the pricing). Then tick the “I confirm I have the publication rights to this book” box, and hit the “Save and Publish” button. Easy as that, huh? Not quite. First Amazon need to review your changes. They tell you that this can take up to 12 hours for an English-language book, or up to 48 hours for a book in another language. It may take even longer if you’re publishing something you don’t possess all the rights to. Then they’ll publish the changes. In real life, it can take quite a while for the process to work through. And even when it’s available on all the various country flavours of Amazon, there may be bits of the system that haven’t picked up the change yet. When we republished It’s all Greek to them! as The Facts Lab Book of Greece , we found that the advertising widgets we’d created at Amazon Associates still displayed the old cover and title. Dave went to update them… and found that the widget product search system was still presenting us with the old book, nearly 24 hours after hitting “Publish” for the new one. (The search engine for customers was offering the new one, though. 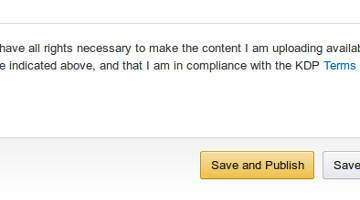 And so was Amazon Associates’ link-building search system.) It did eventually update, though, about three hours later. One other thing. If you decide halfway through that you’re not going to make any changes after all – or even if you just move from the first screen to the second one without changing anything – when you return to the main Bookshelf list of your books, you’ll find that your book is now listed as “Live – With Unpublished Changes”. This is quite an irritation when you’ve not changed anything, though it doesn’t actually cause any harm either – at least, none that I’m aware of. But you can clear it if you republish – you’ll get the usual emails telling you that your update is under review and then being published, but to all intents and purposes your customers will continue to see the same book before, during and after the “republication”.